BPVC-IV-2015 provides requirements for design, fabrication, installation and inspection of steam generating boilers, and hot water boilers intended for low pressure service that are directly fired by oil, gas, electricity, or coal. 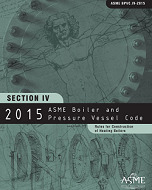 It contains appendices which cover approval of new material, methods of checking safety valve and safety relief valve capacity, examples of methods of checking safety valve and safety relief valve capacity, examples of methods of calculation and computation, definitions relating to boiler design and welding, and quality control systems. Rules pertaining to use of the H, HV, and HLW Code symbol stamps are also included.